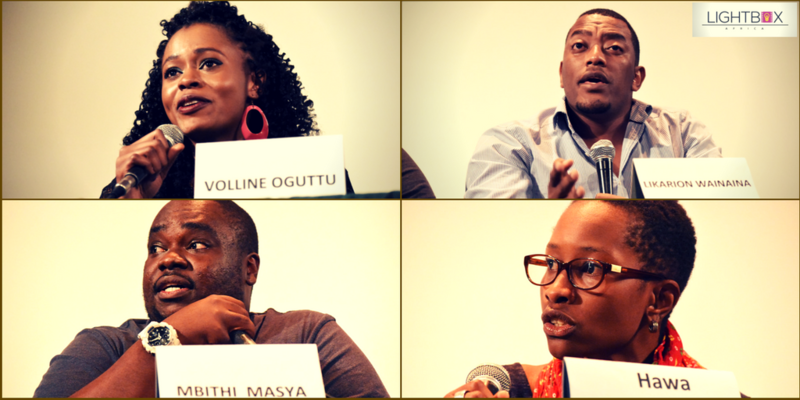 In yet another collaboration between Alliance Française and LightBox Africa, the film scene in Nairobi got to engage with notable directors in the industry. While most may head home early from their day jobs, film lovers gathered at Alliance Française for an evening of CinemAlliance which takes place on the first Monday of every month. Headlining this months’ event was the panel of film directors: Hawa Essuman a Kenyan-Ghanaian director who has directed award winning films such as "Soul Boy", and has worked on various documentary, television and commercial projects; Likarion Wainaina has done various films, television projects and commercials and directed the award winning short film "Bait" which was screened at the Cannes film festival, Voline Ogutu on the other hand is a painter, screenwriter, director and film producer with an award winning short film "Seed" lastly, Mbithi Masya who is a filmmaker, writer and artist as well as director of "Kati Kati" which has so far won the FIPRESCI (International Federation of Film Critics) international film critics’ award at the Toronto International Film Festival. After the previous month's theme on casting this month focused on directors and directing. Se’ydou Mukali, a film director, moderated the session gracefully with a handful of questions from the audience focusing on directors’ perspectiveson Financing, handling success and challenges and their source of creativity. Hawa Essuman had an interesting focus on a director’s role “When directing I think of myself as the captain of the ship because in the end it shows on the material that you want to be bought”. Volines two cents for directors was to have a story then see it from beginning to end and understand the characters and how they relate to each other. As events unfold in their lives these creatives find sources of inspiration for their work. Likarion for instance draws his from the ups and down of life that spurred him on to make some of his most creative work. Despite the hard times in his 7 year career,, Likarion had an emphasis “It is all about self expression when transitioning to film and a good end product eventually has good ripple effects". His budget for "Between The Lines" was Kshs 2,500. “Be as clear in your artistic voice as possible and figure out the money issues later” Hawa Essuman added. When shooting her short film 'Seed', Voline did not have resources yet but success has been on her trail ever since. When it comes to social responsibility Mbithi had a concern, “It is unfair to say Kenyan film makers have not done their part in society because the largest content form a Kenyan filmmaker is based on our moral system”. He then added that the focus for film makers should be on other large film markets with grant money such as Europe and South America as it sustains them. It is evident that these accomplished filmmakers had a vision for the industry in Kenya. Their drive for success was based on the root vision of their film and the audience. We hope to host them yet again. As the panelists left the stage the auditorium was filled with applause from the enthusiastic audience who could not wait to engage with them on a one on one. The 27th Edition of CinemAlliance will be on Cinematography on the 4th of June 2017.